A sport is any activity that requires physical exertion, is institutionalized (in federations or clubs), involves competition with oneself or with others and has a series of perfectly defined rules. 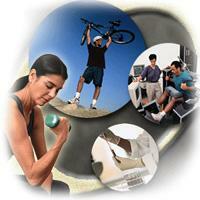 Although the terms sport and physical activity are frequently mistaken, they are not the same. The difference lies in the competitive nature of the former, as opposed to the purely enjoyable practice of the latter. This ranking lists the sports that most people practice in Spain by the percentage of the population that practices them.